Amadablam, one of the most beautiful mountains in the world, is a technical mountain for climbing. Although the height is only 6812m it requires steep ice, rock and snow climbing. Normally, three camps are set in the approach above the base camp (4,570m), however, only two camps are used to spend the night. The normal route for climbing is South-West Ridge. The ascent from Base Camp to camp one is considered one the difficult days of the expedition. We follow old grassy moraine ridges passing through a saddle and then turning to north climbing up rocky ground and through boulders to the ridge where camp I is set up. From camp I, we cross a rocky bowl and climb the ridge frequently alternating the sides along the fixed lines to the camp II. Climbing the ridge involves severe rock climbing which leads to the top of a yellow tower. The climbing route here from camp II changes significantly with the steep mixed gully's of rock, ice and snow. The route leads to the ramp and climbs to an amphitheatre and then passes through steep snow and ice runnel and finally, along the snow ridge to reach camp III. The summit from camp III requires steep climb on snow and ice to the right of a huge hanging glacier. Mt. Ama Dablam is located in the eastern parts of Nepal of Khumbu region. Ama Dablam means "Mother's necklace"; the long ridges on each side like the arms of a mother (Ama) protecting her child and the hanging glacier thought of as the Dablam the traditional double-pendant containing pictures of the gods, worn by Sherpa women. Ama Dablam was first climbed on March 13, 1961 by Mike Gill (NZ), Barry Bishop (USA), Mike Ward (UK) and Wally Romanes (NZ) via the Southwest Ridge. Mt. Ama Dablam is the third most popular Himalayan peak for permitted expeditions. The most popular route by far is the Southwest Ridge. Climbers typically set up three camps along the ridge with camp 3 just below and to the right of the hanging glacier, the Dablam. 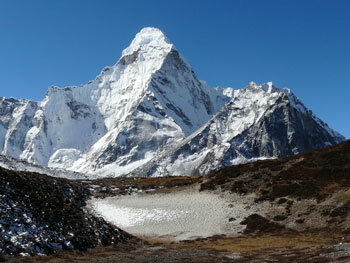 Ama Dablam means "The mother mountain" is regarded as Mother Mountain and female. It stands among many 22,000 to 24,000 foot peaks that surround the high valleys of this region, yet stands out by way of its classic beauty: It is a steep pyramid of ice with vertical walls and sharp, exposed ridges. And from the summit of Amadablam Mountain all round mountains of Khumbu region and both way valley's can be viewed, which is a very interesting and exciting moment. As with Mt. Everest, the best climbing months are April-May (before the monsoon) and September-October. From Base Camp (4650m/15,255ft) to Camp I (5700m/18,700m), climb up a long moderate moraines ridge, giving excellent views of our entire route toward the southwest ridge till the bottom of the large boulders at 5400m. This is the location of the advanced base camp and climb toward the north to reach the camp I. From Camp I up is always incredibly exposed and interesting. From Camp I to II (6000m/19,685ft), encounter the route’s crux rock climbing sections. There are interesting technical traverses combined with countless easy fifth class moves and some short harder pitches of up to 5.8 climbing. On all of this climbing, you will be truly climbing each move, using fixed ropes only to protect yourself. There a spot for an alternate camp close to the two rock fingers. After this first section of snow or easy rock, follows steppers steps and slabs. Traverse to the right to the first 5.6 pitch. Join the ridge which is very exposed on both sides. Follow the ridge in mixed terrain to the right to the bottom of the yellow tower. Climb the yellow tower, 5.9 up to the ridge. Camp II to III (6300m/20,670ft) offers the route’s most challenging ice climbing, with sustained pitches of steep ice and mixed terrain. The final section into Camp 3 is the famed mushroom ridge, a mostly horizontal traverse across cornices tenuously stuck to a knife-edge ridge. Go to the right and climb a few pitches of very steep mixed ground. Join the bottom of the gray tower, go the left of the tower (West face) and climb a gully up to the top of the tower and the mushroom ridge. Climb the mushroom ridge; horizontal and short step sections (60°-70°) up to the flat area of the camp 3 at around 6 300 m / 20,670 ft.
From Camp III to the Mt. Ama Dablam summit, the route lessens slightly in technical difficulty, climbing straight- forward 50-70 degree ice and snow around the hanging glacier (the Dablam) and up the summit face. Climb the steep ice slope on the right of the Dablam. On the top of the Dablam, go to the left and climb the snow slope and ice flute toward the summit (40°-60°). Day 03: By Plane: Kathmandu to Lukla, (35min-2800m). Trek to Phakding, (4h-2640m). Day 04: Phakding to Namche Bazaar, (6h-3446m). Day 06: Namche to Tengboche Monastery (6h-3687m). Day 08: Pangboche to Mt. Ama Dablam Base Camp (5h-4600m). Day 26: Cleaning up Base Camp. Day 30: By Plane: Lukla to Kathmandu.